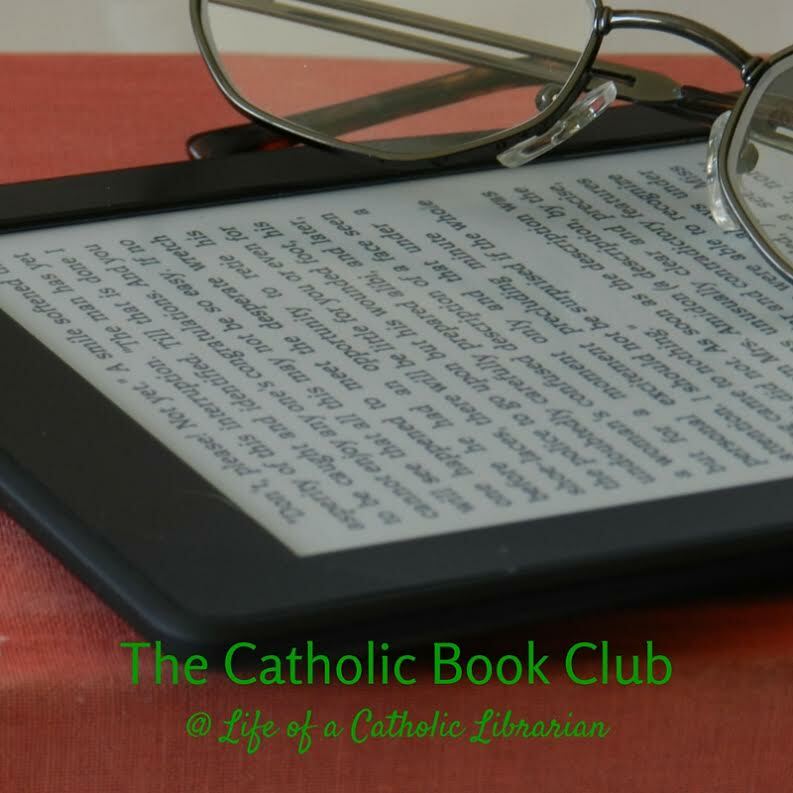 Well, hello to you all, and welcome to the brand new edition of the Catholic Book Club! I'll talk about our first foray into voting for upcoming books and the next selected title at the bottom of this post. We'll need to figure out how we want to structure the posts, since I'm thinking it will be a multi-part endeavor. 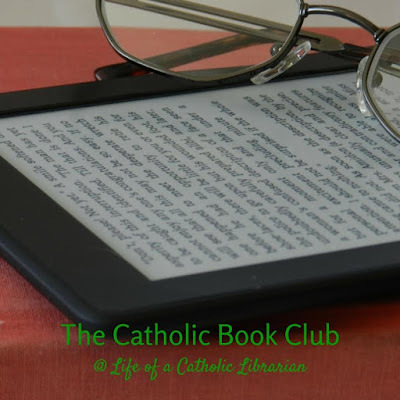 This month we're featuring a Catholic non-fiction title, indeed one of the special Catholic Mom imprint selections from Ave Maria Press, Divine Mercy for Moms by Michele Faehnle and Emily Jaminet. For spiritual non-fiction, this was a quick read for me, which for someone who usually gets bogged down in spiritual reading and doesn't finish, is a really good thing! Originating in the early twentieth century, the Divine Mercy devotion of St. Faustina Kowalska is one of the most celebrated of all Catholic devotions. 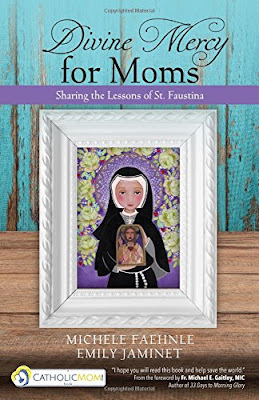 In this, their first book, Catholic bloggers and speakers Michele Faehnle and Emily Jaminet break open the history, practices, and prayers associated with the devotion, guiding busy moms to receive God's message of Divine Mercy and pass it on to others through their words, deeds, and prayers. In her famous Diary: Divine Mercy in My Soul, St. Faustina Kowalska recorded a series of visions of Jesus where he revealed the Chaplet of Divine Mercy and promised that anything can be obtained with the prayer if it is compatible with his will. St. John Paul II formally established the Divine Mercy devotion and canonized Faustina in 2000. The Marians of the Immaculate Conception are dedicated to spreading the Divine Mercy devotion; the foreword for this book was written by Fr. Michael E. Gaitley, MIC, author of Divine Mercy Explained and 33 Days to Morning Glory. With heartwarming stories and practical advice, this book reveals that mercy is not just a gift to be received in the confessional but a spiritual resource that strengthens those who extend themselves in word, deed, and prayer. Designed for personal or group study, Divine Mercy for Moms celebrates the infinite mercy of God and the role of Mary, the Mother of Mercy, in the lives of all believers. The book also includes group study questions, prayers of mercy, and thirty reflections from the authors' website, DivineMercyforMoms. I absolutely LOVED the concept and structure of this book. From the appealing cover art to the practical suggestions and personal examples for acting out the corporal and spiritual works of mercy in our own lives, this book pushed all of my buttons in a very good way. I really enjoyed the beginning chapters which discussed the history of the Divine Mercy image and some background on St. Faustina. The authors' personal stories woven throughout is my favorite approach to non-fiction. Shamefully, I didn't know the corporal and spiritual works of mercy prior to reading this, so I appreciated having everything listed in one spot, with all of the ideas and prayers included for each one. I thought the "30 Days of Mercy" exercises included in the appendix was an excellent addition. A wonderful exercise for Lent or Advent, either with a study group or individually. The only part of the book I found awkward was the fact that there are two authors and it was written in the first person. Specifically, each would identify herself at the beginning of the chapter in parentheses as she began her discussion, and I found that that disrupted the flow of the narrative a bit. That's my only criticism. I'm not certain I can put my finger on a better way to handle the situation, however. The book read quickly for me, I finished well within a week. What did you all think? Please detail in the comments! The Vatican's silence in the face of Nazi atrocities remains one of the great controversies of our time. History has accused wartime pontiff Pius the Twelfth of complicity in the Holocaust and dubbed him "Hitler's Pope." But a key part of the story has remained untold. Pius ran the world's largest church, smallest state, and oldest spy service. Saintly but secretive, he skimmed from church charities to pay covert couriers, and surreptitiously tape-recorded his meetings with top Nazis. When he learned of the Holocaust, Pius played his cards close to his chest. He sent birthday cards to Hitler--while plotting to overthrow him. Church of Spies documents this cross-and-dagger intrigue in shocking detail. Gun-toting Jesuits stole blueprints to Hitler's homes. A Catholic book publisher flew a sports plane over the Alps with secrets filched from the head of Hitler's bodyguard. The keeper of the Vatican crypt ran a spy ring that betrayed German war plans and wounded Hitler in a briefcase bombing. The plotters made history in ways they hardly expected. They inspired European unification, forged a U.S.-Vatican alliance that spanned the Cold War, and challenged Church teachings on Jews. Yet Pius' secret war muted his public response to Nazi crimes. Fearing that overt protest would impede his covert actions, he never spoke the "fiery words" he wanted. But for this one, I just took a peek. We have 26 chapters, about 240 pages worth of material. How would you all like to handle this? Should we read it over the course of the entire summer? Maybe a post per month for May, June, July, possibly August? Somewhere between 5 and 8 chapters at a time? Or do you have another suggestion? Please do chime in! If you're getting this from the library, you won't be able to check it out for that long, so perhaps you'd prefer a different method? I'm all ears! Church of Spies sounds intriguing. I've requested a copy from my local library. They are very generous with renewals so I'm hopeful I can keep it all summer. I like the idea of spreading it out over several months. Perhaps choose a set number of chapters for May and then after reading those we could give input on if we wanted to read more or fewer chapters for the rest of the book. Depending on the feedback the book could carry on until August or end in July. Melanie, girl, this is CLUTCH! I love this idea. Maybe for May 4-5 chapters? I'll download and see how long they are before finalizing. But I like your suggested approach of seeing how it goes before structuring the rest of the summer. Church of Spies: I really like Melanie's idea! It would be good to see how May goes, and then decide how many chapters to do each month for the rest of the summer. I plan on borrowing it from the library, but I don't think I will have a problem renewing it. Whatever is decided, I am excited to read this book with everyone! Sam, thanks so much for your comments! I was really hoping you'd chime in, since you represent a contingent of women that I think, while not necessarily the target audience, still really benefit from the material. That is to say women who are not yet mothers in a physical sense. But there are lots of ways to express motherhood, yes? Women in all walks of life have maternal roles, I think this really applies to all. I just checked on Church of Spies, and interestingly, my library has it as an ebook! There is a waiting list though, and the lending period is only 2 weeks. Which does not bode well for my reading speed. So I'm not sure yet what I'll do!